LIC IDBI Bank Recruitment 2018 LIC who has the largest subscriber of Insurance Items in India and also called Life Line of any Middle class family who take Jeevan Bima Through LIC. LIC may be interested to launch its own bank after seeing the acceptance of IDBI bank into LIC. From many years IDBI is under biggest debt and this move is only to clear all types of DEBTS, NPA of IDBI Bank. 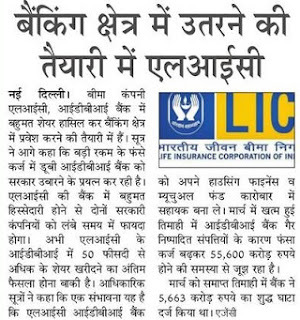 LIC Merger with IDBI Bank Latest News: - From Latest sources said LIC may make IDBI as assistant in its businesses of Housing Finance and Mutual Fund. During quarterly analysis of IDBI debt in March month the Non Performing assets of IDBI roses up to 55,600 Crore. Note: - If any type of Notification related Jobs in LIC bank or IDBI itself release the freedom of Notification in Jobs we soon update.